Weatherford BDK was founded in 1974 to fulfil the need for a specialist engineering support company that could efficiently serve Southern North Sea Oil and Gas operations. Weatherford BDK soon became established as the first choice of operating and service companies for both routine and urgent manufacturing requirements. The application of the highest standards of manufacturing and technical support has allowed Weatherford BDK to expand and has earned the company an outstanding reputation for quality and reliability across the world. The company is now an acknowledged leader in the field of designing, manufacturing, refurbishing and testing of Wireline and Coiled Tubing Downhole Tools and Surface Pressure Equipment. “Traditionally we have used a large number of threaded plugs and rings to measure our internal and external threads. As our thread application range is from ½ inch – 9½ inches, not only is our hard gauging collection expensive to buy, external calibration costs make them extremely costly to maintain. “The recent introduction of a major new product line that included many different sized internal and external threads allowed us to consider a fresh approach to thread measurement. “After looking at the few available thread measuring systems, we believed that Gagemaker products represented the best option for our needs. Having supplied a list of our thread forms and sizes to Gagemaker’s UK agent, Bowers Group, the company suggested a range of functional thread gauges that use interchangeable thread rolls for the measurement of different thread forms, together with a MIC TRAC measurement centre to enable the range of thread gauges to be preset. “Now installed and in regular use, we have received multiple benefits from our Gagemaker equipment. In addition to extending our diameter measuring capability up to 16 inches now, rather than the subjective go/no-go nature of threaded plug and ring gauges, our new system provides actual diameter readings. In addition, we are now able to inspect the effects of thread element variations, such as lead, taper, thread height and pitch diameter. “The operation of our Gagemaker equipment could not be easier, by opening our MIC TRAC measurement center to the required dimension, we are able to quickly and accurately set our new internal and external functional thread gauges to the required sizes. We are then able to apply the gauges to the threads that are to be measured to obtain very accurate measurements. Gagemaker develops and manufactures innovative precision mechanical inspection equipment for the Oilfield, Mining, Water Well, Automotive and General Machining industries. Recognised as the leading provider of Tapered & Straight Thread Measurement Gauges, API Gauges & Products, ISO, ANSI & ASME Thread Measurement, Engineering Software as well as Calibration Software & Equipment, Gagemaker products are used in countless facilities around the world. Gagemaker’s MIC TRAC, as used by Weatherford BDK, is an electronic, adjustable calibration and measurement centre that is able to, preset indicator style gauges, and calibrate a wide variety of hand held inspection gauges. The robust yet accurate MIC TRAC 3000 series is suitable for use within most environments, from the shop floor to calibration laboratories. The MT-3000 series measurement system includes the base unit, which houses the optical scale that provides the MIC TRAC's high precision measuring capability. The base unit may include an optional Force-Lok™ feature that enables a constant measurement force to be applied, improving repeatability from operator to operator. Receiver pads, which are precision ground in matched sets, are used as parallel surfaces for accurately measuring or holding fixtures, whilst the MT-3000’s digital readout (DRO) displays measurement readings in inch or metric. Gagemaker’s Functional thread size gauges are designed to inspect the effects of all thread element variations and report deviations (functional size). 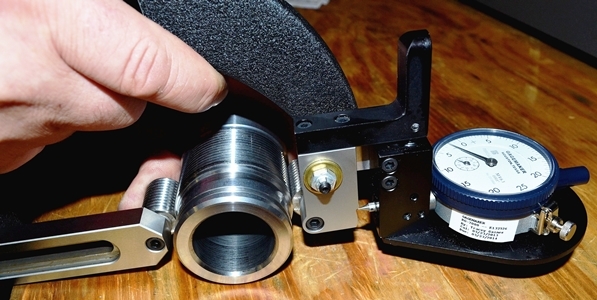 Before inspecting parts, the gauges must be preset to a nominal predetermined dimension using gauge blocks, micrometers, or ideally Gagemaker’s MIC TRAC measurement centre. To ensure maximum accuracy, Gagemaker’s functional thread gauges use matched sets of precision ground, interchangeable thread rolls that seat in the threads during inspection. Each set of thread rolls is designed to ANSI specifications to measure unlimited diameters within a specific thread form. Common pitches ranging from 4 TPI to 20 TPI of the UN Series, ACME, and Stub ACME, and 1.5mm to 4 mm of the ISO Metric thread rolls are carried in-stock, whilst many other thread forms thread rolls are also available. All setting sizes and thread dimensions can be determined using the Gagemaker TDWIN Thread Calculation Program also available from the Bowers Group. For more information on Bowers' range of Gagemaker products click here.